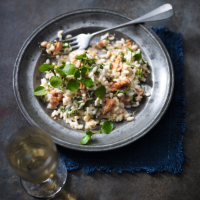 This rich, creamy risotto is perfectly balanced by the fresh flavours of the salmon and watercress. 1. Heat the butter in a medium saucepan and gently fry the shallots for 2-3 minutes until just beginning to soften. Add the rice and fry for a further 1-2 minutes, until the grains start to turn see-through around the edges. 2. Add the wine and lemon juice, stirring all the time until it has mostly evaporated. Add a ladleful of stock, stirring until almost completely absorbed. Carry on adding stock a ladle at a time - this will take around 18-20 minutes. 3. Continue until the rice is just cooked, but still with some bite. Stir through the chunks of red salmon, mascarpone and the chopped watercress. Divide between 4 shallow bowls and serve garnished with the reserved watercress sprigs. Add a fragrant garnish by grating a little lemon zest over each dish before serving.